Surrounded by the Atlantic Ocean to its north and the Caribbean Sea on its south, this island paradise boasts over 1,000 miles of beaches and is the second largest country in the Carribbean. The Dominican Republic has emerged as a popular destination for families, couples and adventure seekers . As a leader in environmental protection and sustainable tourism, more than 20 per cent of land and coastal areas are protected. Activities available include golf, waterfall-cascading and canyoning. Dominican Republic has eight international airports, seaports and marinas. 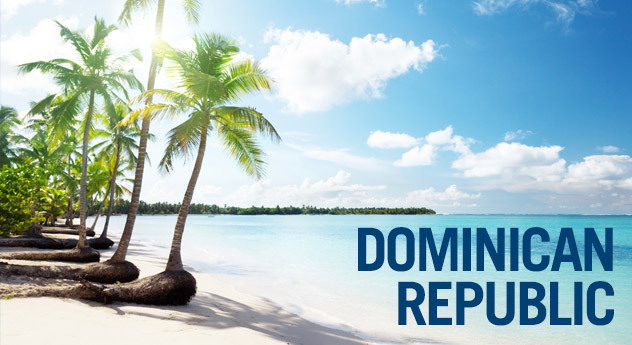 Browse through hundreds of all inclusive vacations to Dominican Republic on Travelocity.ca. These Dominican Republic vacations are available for every budget and offer a stress-free way to plan your next trip. Travelocity.ca makes it easy to find the right all inclusive vacation. Choose from the resorts below or search using our tool on the left to find your next Dominican Republic vacation. Last-minute vacations or vacations planned months in advance are just a click away.